A BListView displays a list of items the user can select and invoke. Each item is a kind of BListItem object. The BListView manages the layout of the list and the interaction with the user; it leaves the display of each item to the BListItem objects. A BListItem is not a view and draws only when called upon by the BListView. The figure below depicts a window that contains a sample BListView. A BListView displays all items unindented at a single level. A derived class, BOutlineListView, can arrange items in an hierarchical outline. This class is based on the BList class of the Support Kit. It implements counterparts for all BList member functions, so you can treat a BListView object just like a BList. BListView simply makes the list visible. A BListView assumes that the list contains pointers to BListItem objects, not void* pointers. A BListView makes sure that the on-screen display is properly updated whenever the items in the list change. In both classes, the list keeps track of data pointers—void* pointers in the case of BList and pointers to BListItems in the case of BListView. Adding an item to the list adds only the pointer; the pointed-to object isn't copied. When the contents of the list change, the BListView makes sure the visible list on-screen is updated. However, since it records only pointers to data, it can know that something changed only when a BListItem is added or removed. If an item pointer remains the same but the data the item displays is altered, the BListView won't know about it. In this case, you must force the list to be redrawn (by calling the InvalidateItem() function or BView's Invalidate()). The user can click an item in the list to select it and double-click an item to both select and invoke it. The user can also select and invoke items from the keyboard. The navigation keys (such as Down Arrow, Home, and Page Up) select items; Enter and the space bar invoke them. 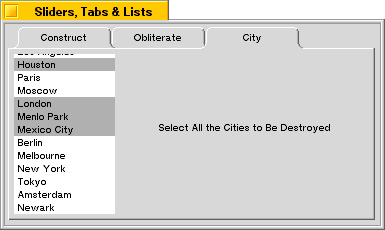 By default, a BListView permits only one item to be selected at a time. However, at construction and with the SetListType() function, you can set it up to allow multiple selections. The user can make contiguous extensions to the current selection by holding down a Shift key, and discontinuous extensions by holding down an Option key. The BListView highlights items as they're selected, but otherwise it doesn't define what, if anything, should take place when the selection changes. You can determine that yourself either by implementing a SelectionChanged() function in a derived class or by registering a selection message (a BMessage object) with the BListView. The function is called and the message is delivered to a target destination whenever the user modifies the selection. Similarly, the BListView doesn't define what it means to "invoke" an item. You can register a separate invocation message that's sent whenever the user double-clicks an item or presses Enter or the space bar while items are selected. For example, if the user double-clicks an item in a list of file names, the message might tell the BApplication object to open that file. A BListView doesn't have default selection and invocation messages. Messages are sent only if registered with the SetSelectionMessage() and SetInvocationMessage() functions. Before sending either type of message, the BListView adds information to it identifying itself and the items that are currently selected. See the Invoke() function for details. BListView provides an autoscroll feature: There's an invisible area about 25 pixels high both above and below the list view; if the user clicks inside the list view and then drags into this autoscroll area, the contents of the list will scroll in the direction of the mouse. BListView also provides optional item-dragging that let's the user reorder the items in the list. To turn on this feature, you have to subclass BListView and implement InitiateDrag() to return true. See the BScrollView class for a more in-depth explanation of scrolling views.